Anti-vaccine scientific “research” is rife with poorly designed studies, bad statistical analysis, and numerous retracted papers. 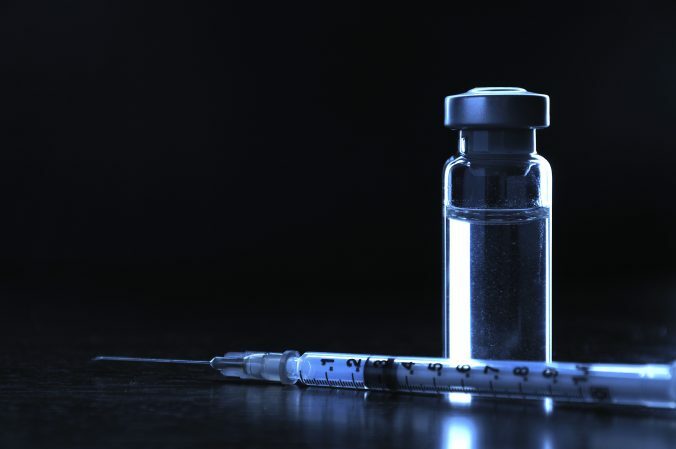 Even the core of the modern anti-vaccine research is a retracted article by Mr. Andrew Wakefield which attempted to connect the MMR vaccine to autism spectrum disorder. Of course, real science published in real journals have conclusively shown that vaccines are not related to autism. There are literally hundreds of articles published about vaccines and autism, and yet almost all of them, published in the best journals, show no relationship. Predictably, the anti-vaccine crowd will cherry pick any study that supports their narrative about vaccines, regardless of the quality of the “science,” or the reputation of the journal. They even promote other retracted articles to support the case of the dangers of vaccines. Well, let’s see what they’re promoting this time around. I’m sure none of us will be surprised. Screenshot of the retracted anti-vaccine research article. 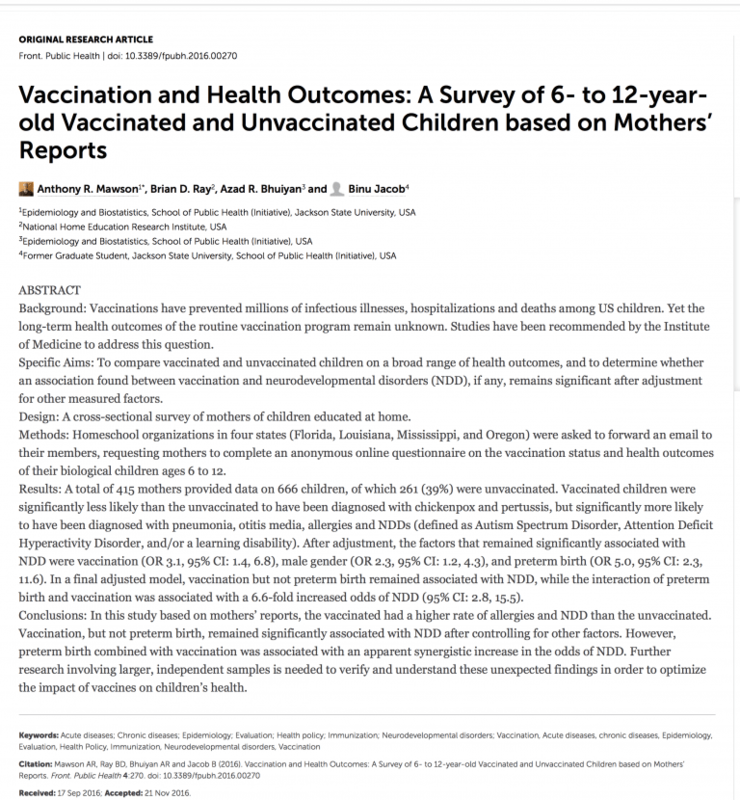 A new study, “Vaccination and Health Outcomes: A Survey of 6- to 12-year-old Vaccinated and Unvaccinated Children based on Mothers’ Reports” was published in an obscure journal, Frontiers in Public Health. I would link to the article, but the link is dead. We’ll get to that later. This study intended to “compare vaccinated and unvaccinated children on a broad range of health outcomes, and to determine whether an association found between vaccination and neurodevelopmental disorders (NDD), if any, remains significant after adjustment for other measured factors.” This is a good start, and if done well, it could provide us with more information about any potential links between vaccines and NDDs such as autism spectrum disorder. Surveys are not the best way to gather data about medical issues. They are observational data, which are not the best type of data to reject or accept an hypothesis. The CDC uses surveys to determine vaccination uptake, for example, but they used a non-biased methodology to gather data. They surveyed nearly 15,000 children, and were given permission to contact the health care provider to get more information. The study found that 39% of children surveyed were not vaccinated. Now if we accepted this data without analysis, we’d think that the vaccination rate has dropped. However, that’s not what we’ve seen in other, better-designed surveys, such as the CDC’s massive ones, which showed that vaccine uptake was between 85 and 95% depending on the vaccine and the area. With such a difference between this study and better designed ones, one would have to believe that the study with a much smaller number and an apparently biased population would be the outlier. The paper was peer-reviewed by Linda Mullin Elkins, a chiropractor at Life University – a chiropractor does not have the scientific background and knowledge of public health to be a valid peer-reviewer. Chiropractic is mostly a pseudoscience, so it’s not surprising that they would positively assess an anti-vaccine research article. Retraction Watch reported that “in July, the same Frontiers journal retracted a study on chemtrails, an age-old conspiracy theory about the dangers of cloud trails released by jet planes.” They also reported that, “earlier this month, another Frontiers journal retracted a paper about predicting whether people are dead or alive by looking at their photographs.” Chemtrails? That conspiracy theory that the government (or someone) is poisoning us from jets flying above us? I’m sorry but if you’re publishing articles about chemtrails, then your reputation is near zero. The primary author, Anthony R Mawson, from Jackson State University, has a long, established background of supporting the aforementioned Andrew Wakefield along with anti-vaccine research. No, their data does not give any confidence that their conclusions are supported. They are using biased methodology to arrive at a preconceived conclusion, basically all that science is not. This article was provisionally accepted but not published. In response to concerns raised, we have reopened its review. As you can see, the article was retracted with this statement: “This article was provisionally accepted but not published. In response to concerns raised, we have reopened its review.” This happened after heavy criticism across the scientific community, and I’m happy to have the chance to pile on. Still, that didn’t stop the anti-science and anti-vaccine community from latching onto this bad article. Yes, that’s Andrew Wakefield touting this study. Ironically, even a retracted study doesn’t matter to Wakefield – as if any of us are surprised. So there you go. Another anti-vaccine research article has been retracted, because it fails to show anything scientific. But the anti-vaccine cult is patting itself on the back that it has further “proof” that vaccines are linked to autism. Except real science says otherwise. Hill HA, Elam-Evans LD, Yankey D, Singleton JA, Kolasa M. National, State, and Selected Local Area Vaccination Coverage Among Children Aged 19-35 Months – United States, 2014. MMWR Morb Mortal Wkly Rep. 2015 Aug 28;64(33):889-96. PubMed PMID: 26313470.